Join a growing and in-demand career field! This nationally recognized training program will teach you the fundamentals of Adobe Photoshop, the gold standard for image creation and editing. This program will teach you graphic design basics and build your skills step-by-step, as you master the terms and processes used by professional graphic artists. You’ll not only learn the rules and standards for effective graphic design, but you’ll also discover strategies for creating graphics that convey desired messages, styles, and tones. You’ll practice with real-world examples, challenges, and thought-provoking assignments, and learn how to determine a client’s needs, design marketing materials to meet those needs, in addition to assembling your designs in an online portfolio to enter the industry. This program will help you create images that stand apart from the competition, in addition to positioning you for a rewarding career in graphic design. 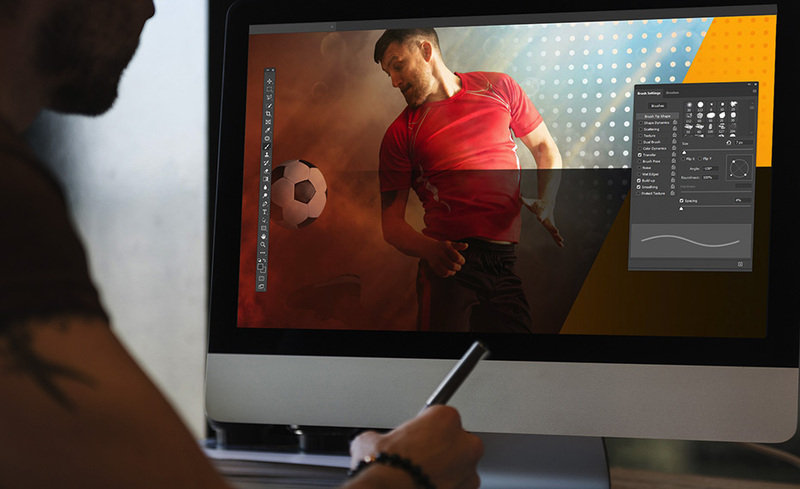 The need for cutting edge, professionally-designed interactive media keeps growing, and that means qualified graphic designers are in high demand. In this nationally-recognized program, you’ll prepare for a dream job in the graphic design field by mastering Photoshop, the world’s most popular application for creating and editing graphic images. You’ll begin with basic graphic design techniques and build your skills from the bottom-up, mastering the terms and processes that professional graphic artists rely on. You’ll learn the rules and standards for effective graphic design and discover innovative strategies. This knowledge of graphic design will help you select graphics that convey the desired message, style, and tone for a variety of clients. Additionally, you’ll discover how to correctly package a project for printing and production. Software is not included in this program. You must either have Photoshop CS6 or Creative Cloud installed before enrolling. When you register you receive nine (9) months to complete this program. B. What is the client trying to promote? C. Who is the target audience? This program can be taken from either a Mac or a PC. It is compatible with Windows 7, 8, 10, or Vista for PC users. Internet Explorer is not compatible with this program. You’ll need to use a browser such as Chrome, Firefox, or Safari. There are no specific computer requirements other than an Internet connection, e-mail account, and Microsoft Word (for assignment submissions). 1,024 x 768 display resolution with true color. Software is not included in this program. You must either have Photoshop CS6 or Creative Cloud installed before enrolling. The examples in the program use CS6, but if you have Creative Cloud, your software will be comparable. Previous experience with Photoshop is not necessary. Software is not included in this program. You must either have Photoshop CS6 or Creative Cloud installed before enrolling. Laurie Ulrich has been practicing for more than 20 years. She received an education in the arts, and has been a professional graphic designer in many professional areas. She started her own company in 1992 to provide design, marketing, training, and technical documentation services to companies all over the world. Laurie is the author of several titles on Photoshop, InDesign, and general graphic design topics. These titles include The Photoshop CS3 Bible and How to Do Everything Adobe InDesign CS4. She is currently an adjunct faculty member at the Pennsylvania College of Art & Design. She was an adjunct faculty member at Temple University for more than 10 years, teaching everything from Microsoft Office to Adobe Photoshop to Web Design. Randy Rolen has been a professional Graphic Designer for 32 years. After working as the Senior Graphic Designer in high tech companies for many years, he started his own design firm in 1993, and began to specialize in web based design, including websites and banner advertising. He has also been teaching online since 2002. All of our programs are self-paced and open enrollment, so you can start them when you want and finish them at your own pace. When you register you receive nine (9) months to complete this program. ed2go will ship all materials ground service upon enrollment. Software is not included in this program. You must either have Photoshop CS6 or Creative Cloud installed before enrolling. 12. Do I need to be an artist or have an art background to take this course? Absolutely not. The concepts of good graphic design can be learned, and any talent you may have as a designer can be enhanced, but it is not required. Learning Photoshop doesn’t require artistic ability of any kind, because you’ll find that you have levels of creativity within you that you didn’t know about, as you practice design techniques within this powerful software. 13. Will I be able to market myself as a graphic designer after taking this class? Like most things, practice makes perfect. You’ll have the basic design skills and Photoshop abilities to take on most graphic design projects, but it’s recommended that you do some pro-bono (no-charge, for needy organizations, family businesses, etc.) work before you put yourself out there as an experienced designer. Build your portfolio based on what you learn in this class and apply your experience to a few jobs before you making an official leap as a Professional Graphic Designer. 14. Can I make a good living as a graphic designer? Yes, if you work hard and develop a good client list. It’s important to seek clients out, provide all the services you can to these clients, and make good connections for word-of-mouth referrals. Also, stay involved with professional organizations, chambers of commerce, or local small business networking groups. Get your name out there, and use social media to promote your services. 15. What if I don't have enough time to complete my program within the time frame provided?